Every day, Michelle Philpots wakes up in bed thinking that the year is 1994 and that the person sleeping beside her is a complete stranger. Only after the stranger shows her a photo album of their wedding day twenty one years ago, and she sees the hundreds of post-it notes scattered around her room, does she realize that the stranger is her husband, Ian, and that everything he has told her about the accident is true. Philpots has a rare case of anterograde amnesia, caused by severe trauma to the head from two accidents: one in 1985 and the other in 1990. She cannot recall and store memories past 1994 because her memory is wiped every day without fail. Her case is so severe that memory loss can occur in a few minutes rather than at the end of every day, and there are times where she forgets the name of a person she met minutes ago. 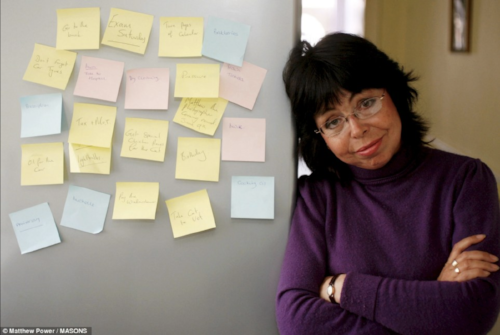 Philpots photographed with the dozens of notes she writes for herself every day. We know that there was a disruption in Philpot’s memory processes, but what exactly is memory? It is not something tangible that can be seen or touched, like a freckle or a strand of hair. Yet, we know that we can remember what happened yesterday by just thinking about it; maybe we went out on a family road trip or to a horror movie with friends. Those are all memories! In simple terms, memory is all of what we remember. It gives us the ability to retain past information such as learned facts, experiences, and skills that can be used for influencing future actions. For example, we remember (hopefully!) material taught in a class which we can use to ace a test a week later. Although the concept of memory may be simple, the many processes behind creating memories, including encoding, storing, and retrieving, are not all yet quite understood by scientists. We may not be able to understand everything about memory, but we can begin to understand some of the reasons why our memory may fail. The general term for memory loss is amnesia. Amnesia is caused by anything from neurological reasons, such as drug use, physical injury, a neurological disorder like Alzheimer’s, to psychological factors, such as defense mechanisms, mental disease, or emotional stress. Amnesia is also common in degenerative brain diseases in which parts of the brain holding long-term memories can be destroyed, resulting in loss of information. In most cases, amnesia is temporary and can last up to several days, but the more traumatic the accident was, the more severe the amnesia may be, possibly leading to permanent damage. There are two main types of amnesia: anterograde amnesia and retrograde amnesia. Diagram of the types of amnesia centered around a traumatic event. Anterograde amnesia is the loss of the ability to create new memories, which commonly occurs after a traumatic incident such as a car accident that has caused damage to the hippocampus or cerebral cortex. People with anterograde amnesia are unable to process sensory input and new information into long-term memory, which is why long-term memories cannot be retrieved to influence future actions. If the person suffered from the accident, most of their memories before the incident would be intact and functioning normally, demonstrating that they only lost declarative memory, an explicitly type of memory that is stored and retrieved such as the type of toothpaste you use, but still had their procedural memory, a type of implicit memory representing the past learning of motor skills and habits such as riding a bike. While anterograde amnesia is the loss of ability to remember new memories, retrograde amnesia is the loss of ability to remember old memories. After the onset of retrograde amnesia, the individual would have difficulty remembering information and experiences from before the event but may still be able to encode and store new memories afterwards. This disorder is usually caused by damage to some other part of the brain rather than the hippocampus because long-term memories are stored throughout the entire brain by neurons and synapses so damage to these storage areas would degrade an individual’s ability to recall past memories. Retrograde amnesia is also usually temporarily graded, meaning that it is easier to recall an individual’s oldest memories than memories right before the accident. Though less common, the combination of both anterograde and retrograde amnesia is known as total and permanent amnesia. Clive Wearing, a British musician, is the most well-known case of this type because of damage caused by a virus in 1985. He is unable to create long-term memories or recall memories from before the past 30 seconds. One notable example of this is when he greets his wife like he had not seen her in ages, when she actually only left to go to the kitchen half a minute ago. Because he is unable to recall past memories, he cannot remember the last time he saw his wife and because he is unable to create long-term memories, his brain does not create the memory of seeing his wife seconds earlier. Thank you for reading, and join us for our next article!